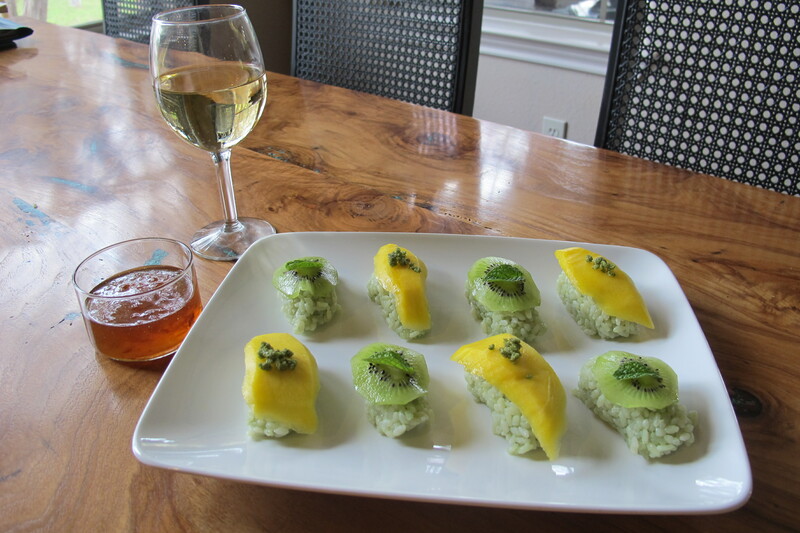 Kiwi and Mango Nigiri : It’s Easy Being Green : Marx Food Contest! 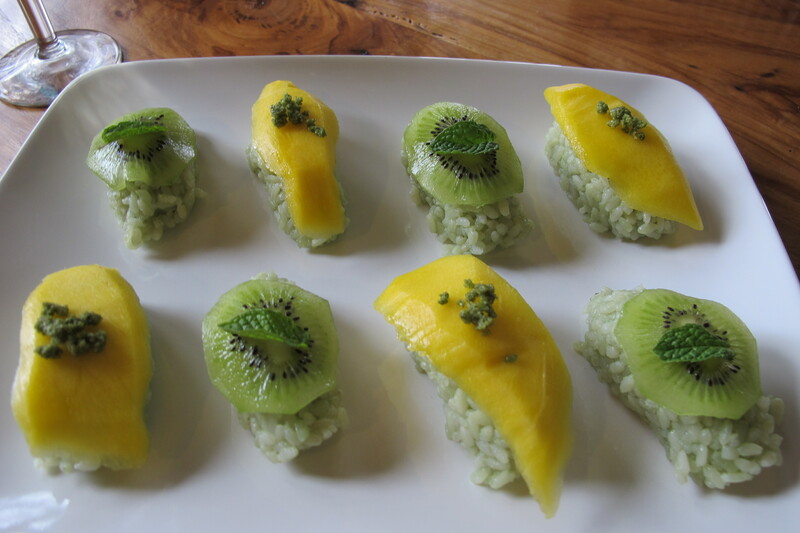 I chose to use the Bamboo Rice, Cardamom, and the Mint Herb Crystals to create a Kiwi and Mango Nigiri. 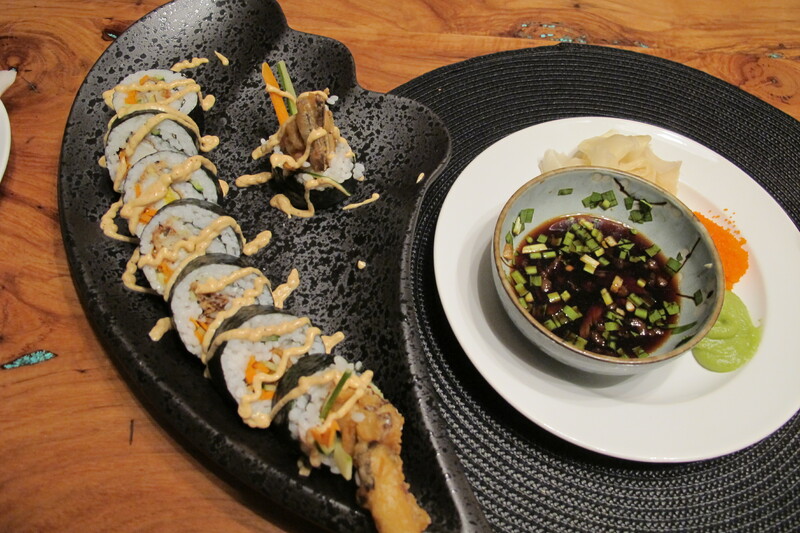 This was a tasty and whimsical play on dessert and sushi that I will be making it again for sure, probably for a dinner party. 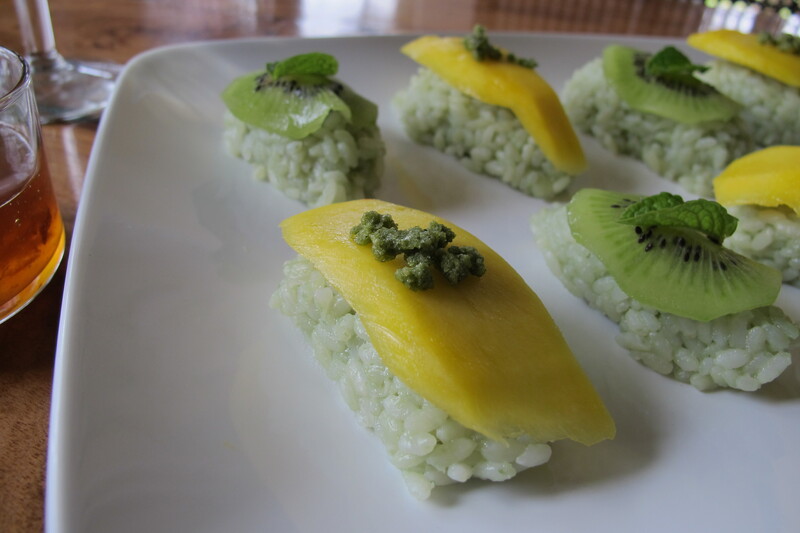 The cardamom infused bamboo rice was subtle yet alluring and the slight crunch of the crystalized mint paired surprisingly well with the mango and bamboo rice. 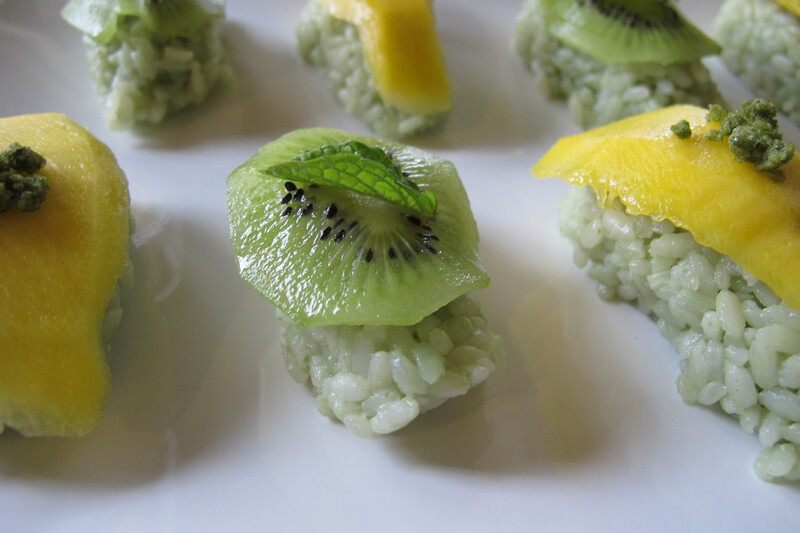 I couldn’t resist doing kiwi not only because it’s green but also because I love it and the little seeds gave a great texture to the nigiri. 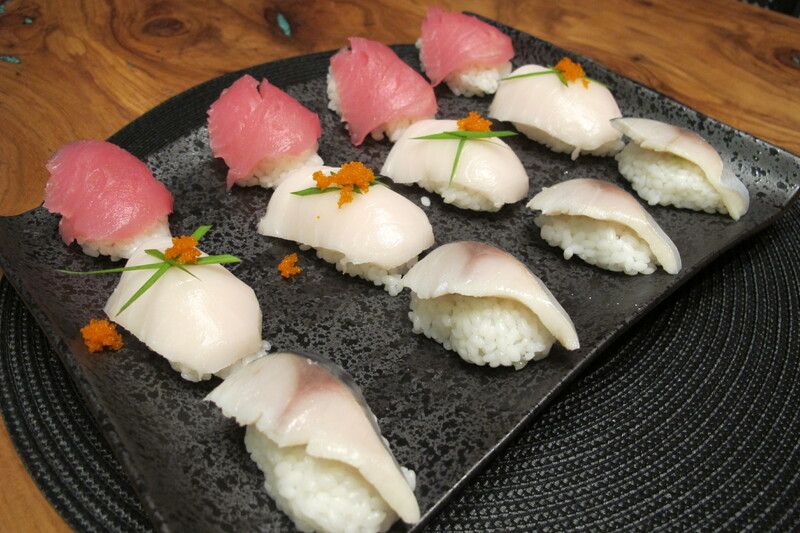 The nigiri was then served with a orange honey marmalade and rice wine sauce. 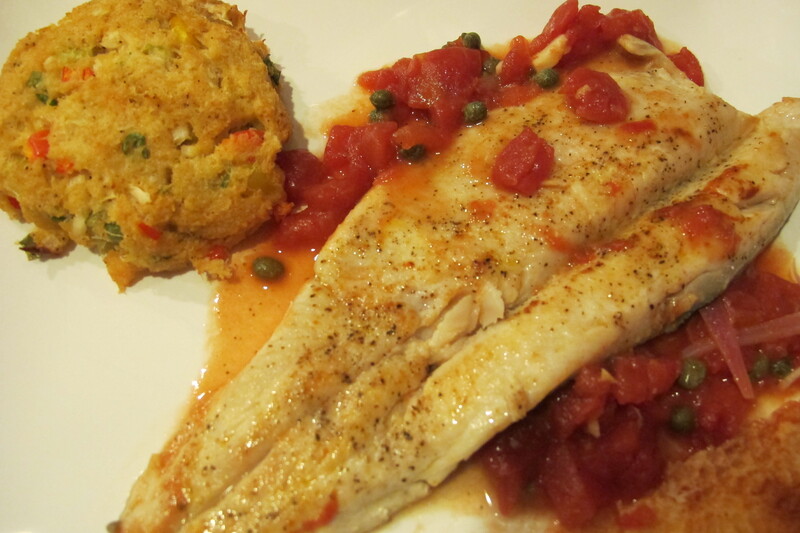 Overall it was a fun dish, to eat and to make! 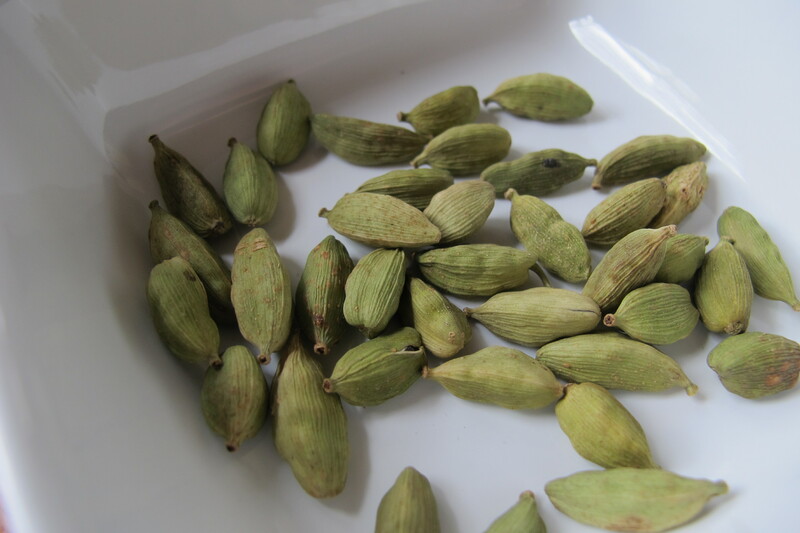 Boil 1 Cup of water add crushed cardamom pods and seeds, let sit for 10 min on simmer. Strain and reserve water for rice. 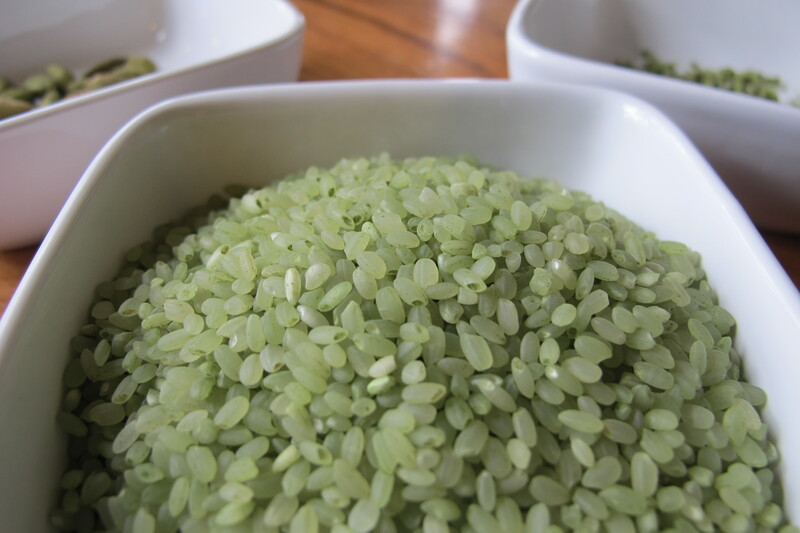 Add rinsed bamboo rice to water bring to a boil, add 1 tsp rice wine vinegar, cover and simmer for 20 min or until done. 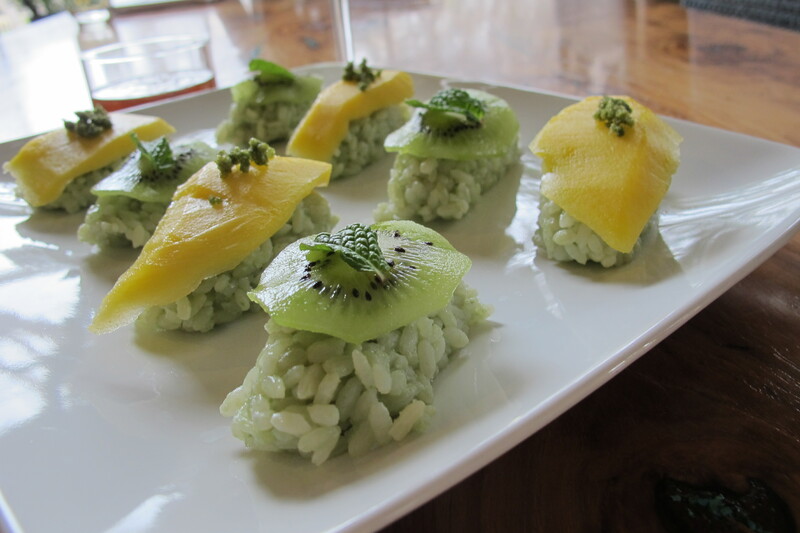 Cut up kiwi and mango thinly to arrange on top of rice. Let rice cool for about 20-30 min. 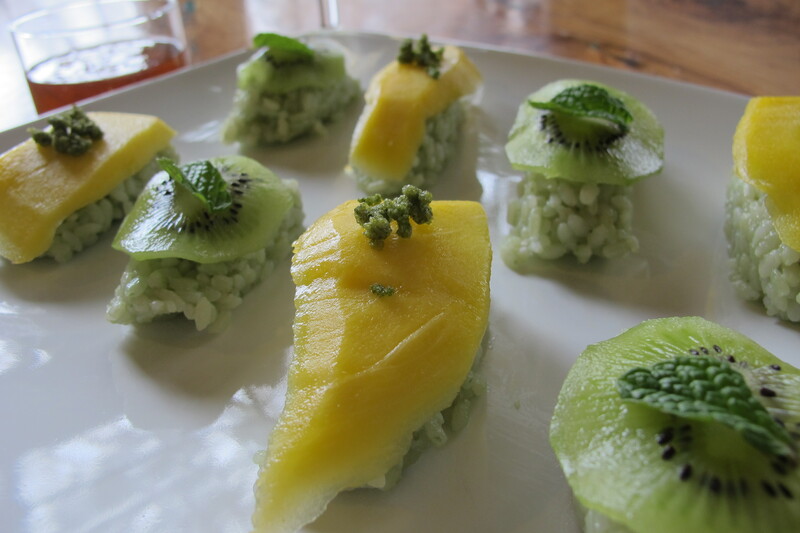 Make 8 nigiri mounds with your hands and place fruit on top and garnish with crystalized mint and real mint. 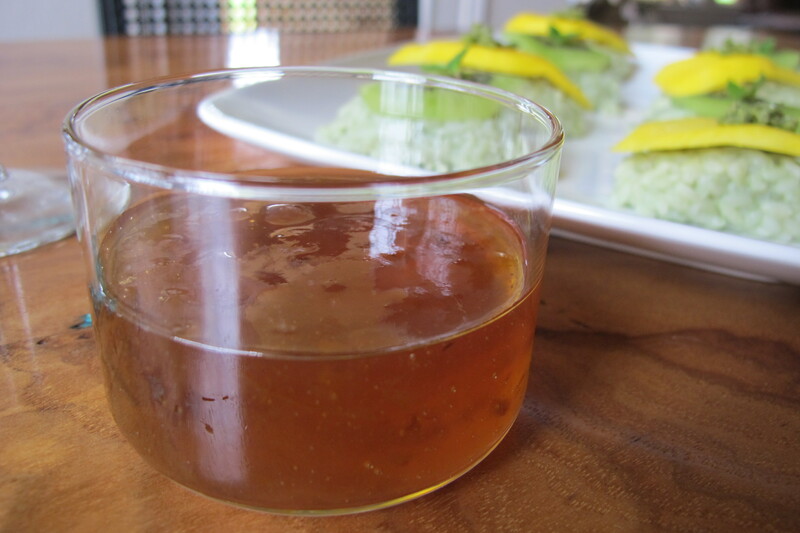 Serve with honey orange marmalade with a splash of rice wine. Enjoy with a glass of wine! 10 Large raw shrimp, peeled and deveined, leave tail on. 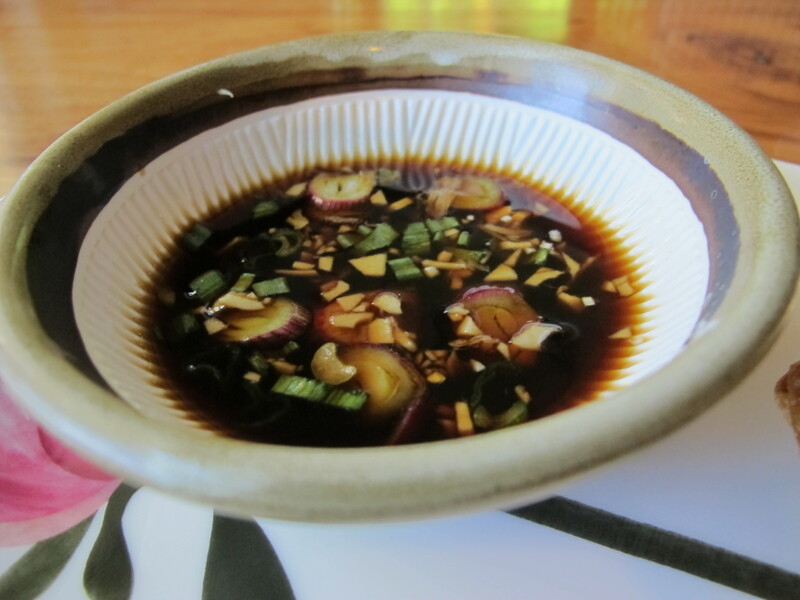 Make a vinaigrette with balsamic, 1 TBS olive oil, pinch of dill pollen, pinch of salt and pepper. Mix well. Roast veggies on foil lined pan with 1 tbs olive oil and salt and pepper pinch for 20-25 min. Reserve in foil to keep warm. Heat medium skillet to high and saute shrimp in a TBS of olive oil, season with salt and pepper. 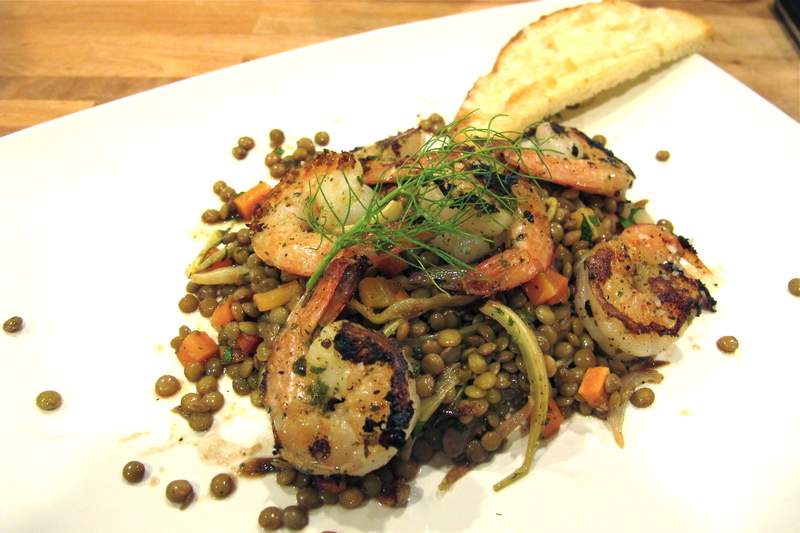 Mix roasted veggies, lentils, and vinaigrette together and serve shrimp on top. I’ve entered into another contest 🙂 … Marx Foods Cocktails and Mocktails Contest! They graciously hooked me up with several ingredients to experiment with: fennel pollen, saffron, long pepper, dill pollen, juniper berriesand dried pineapple. I love experimenting with new cocktails so I was very excited about this challenge. I know many of you will be in shock… but for this challenge I did NOT use Yuzu. 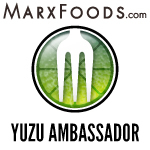 Being a Marx Foods Yuzu Ambassador (it’s official, I have a badge), I know I have probably committed a Yuzu ambassador sin. The truth is, I just ran out last week (had it been in the fridge we all know it would have been in there somewhere)! Anyhow! I’m more than pleased with my results! The clementine ice cubes make this cocktail over the top! When you get the little bits of fresh squeezed clementine it makes this drink extra special! The subtle hint of cucumber and saffron makes this drink a delightfully refreshing cocktail that everyone will enjoy! 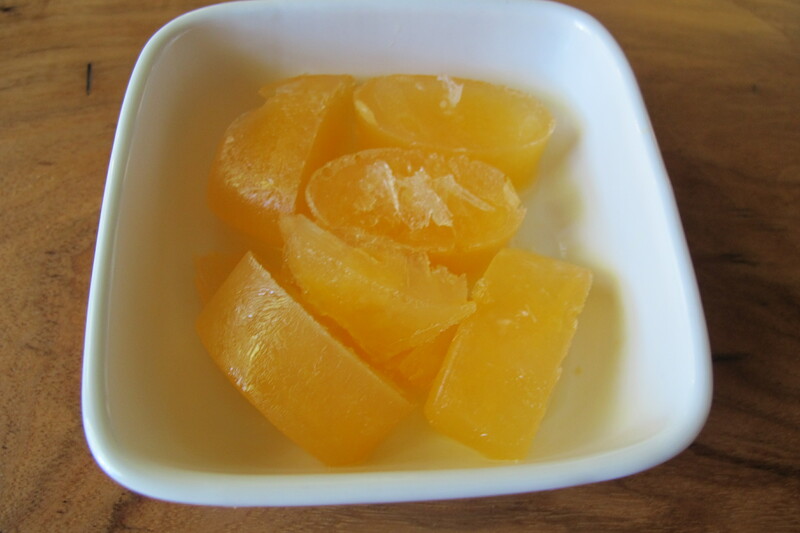 6 Clementine ice cubes (see below for instructions). Place juice in tray and freeze overnight. 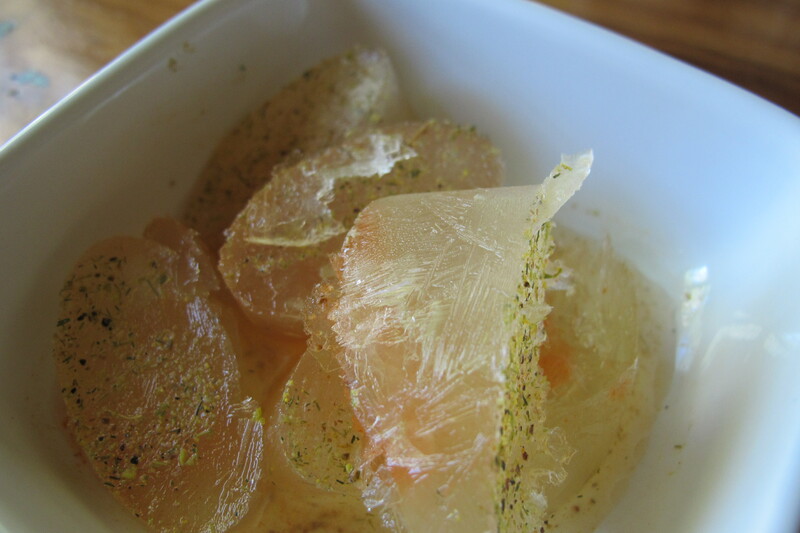 Place 3 clementine ice cubes and 3 regular ice cubes in glass with slice of cucumber. Take saffron threads and mix them with Meyer lemon juice until bright orange. 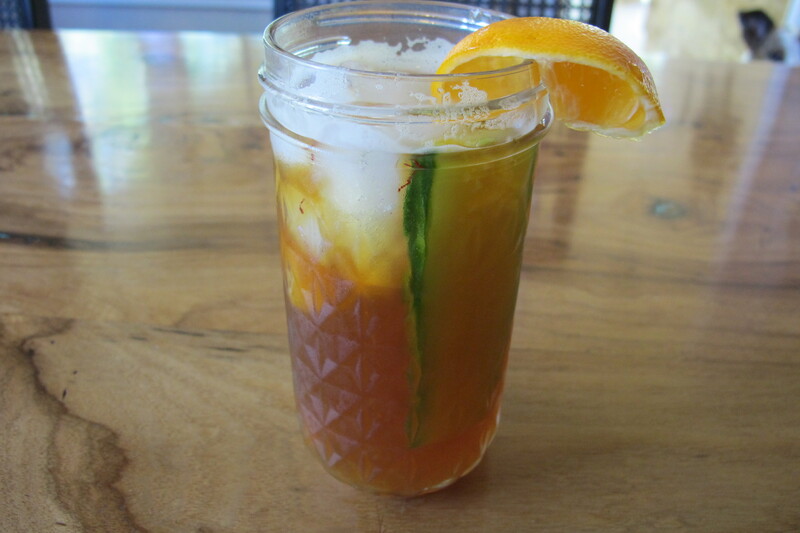 Put half a TBS in each cup of Pimm’s. 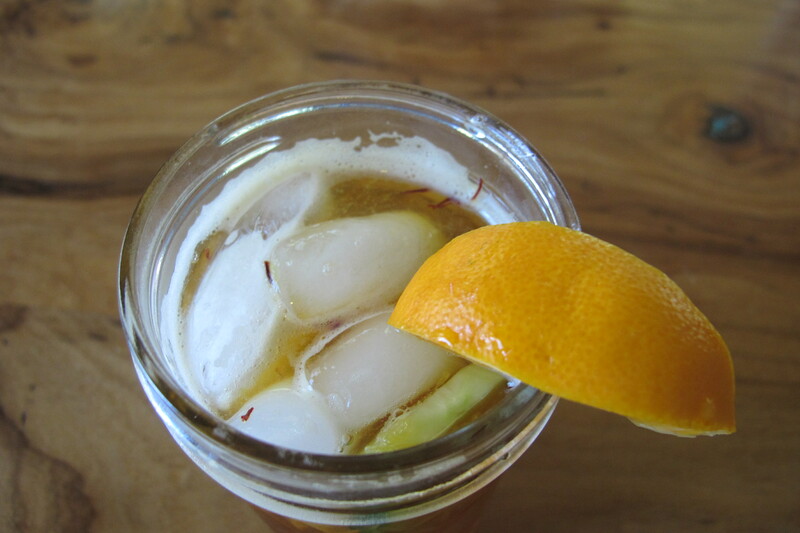 Top with Gingerale and Clementine garnish. 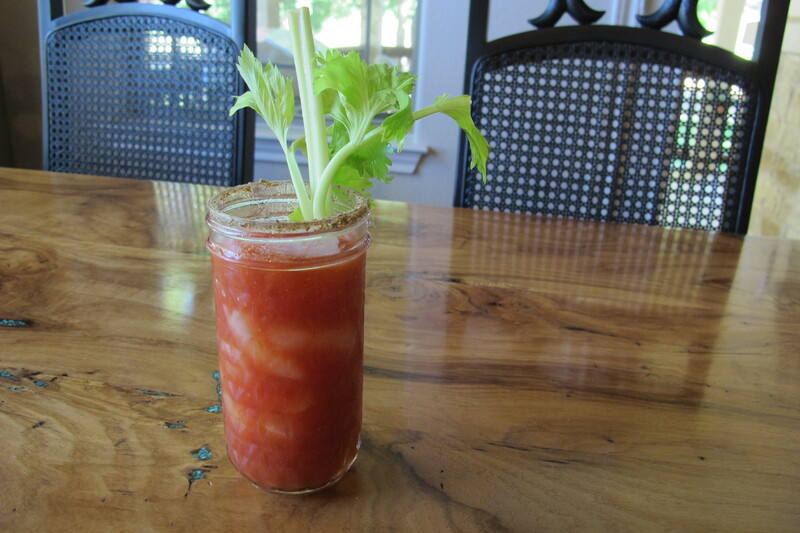 The perfect savory mocktail for the a.m. or p.m. ! 1 tsp. 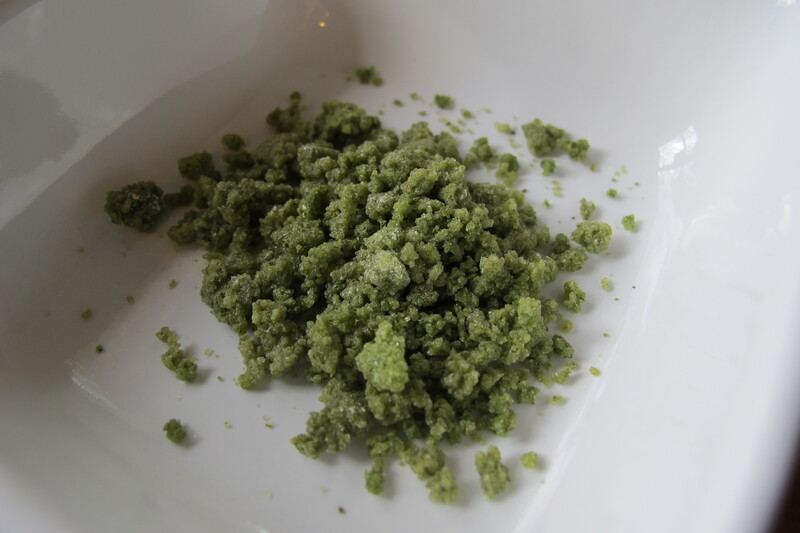 Dill Pollen and Long Pepper, ground (2 long peppers, 1 tsp dill pollen) Use this mixture for Ice cubes as well. Fill with olive juice almost to top. Place 8 drops of Franks in each cube. Top with 1/8 tsp. ground dill pollen and long pepper in each cube. Place 3 Franks dill pollen, long pepper, olive juice ice cubes in a cup. 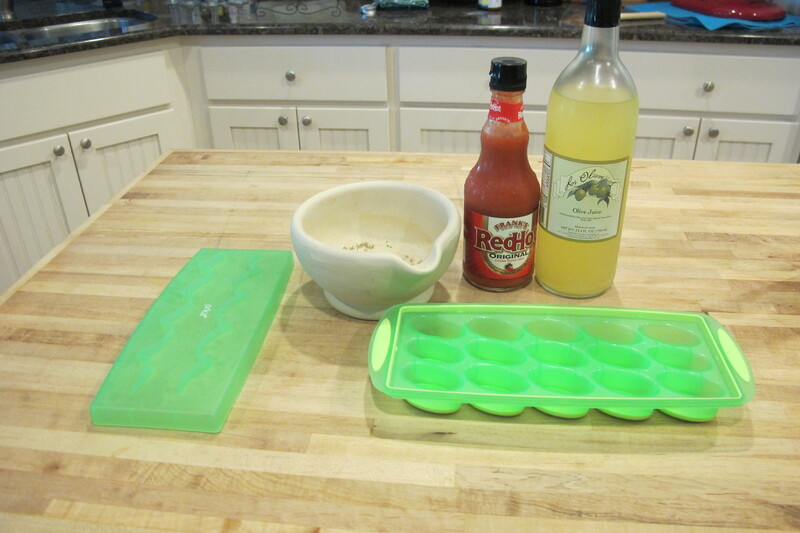 In a shaker: shake 3 Ice cubes, 11 oz tomato juice, 1 tsp. dill pollen and long pepper mix, 1 tsp worcester sauce. 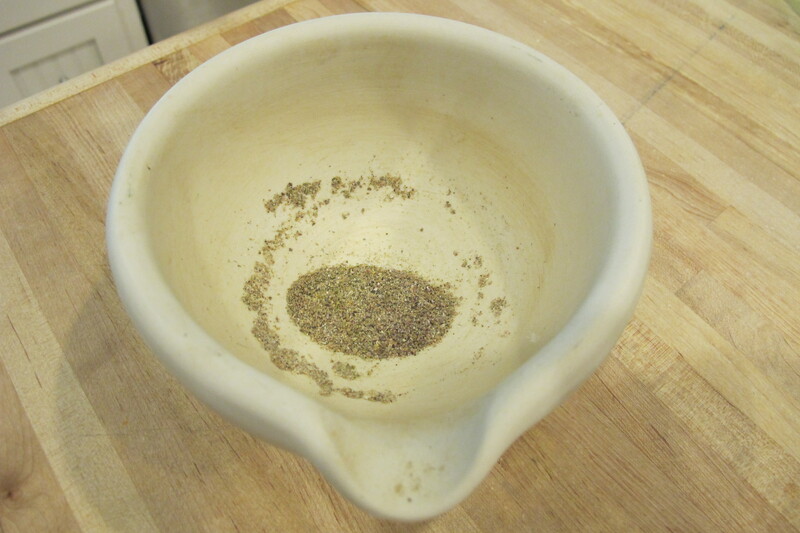 SHAKE well and pour over Franks Dill pollen, long pepper cubes and garnish with celery stalk. This is a great bloody mary/mocky mocktail! It would even go great as a breakfast component! Disclaimer: I did not receive any compensation from Marx Food for this post. All opinions are my own. 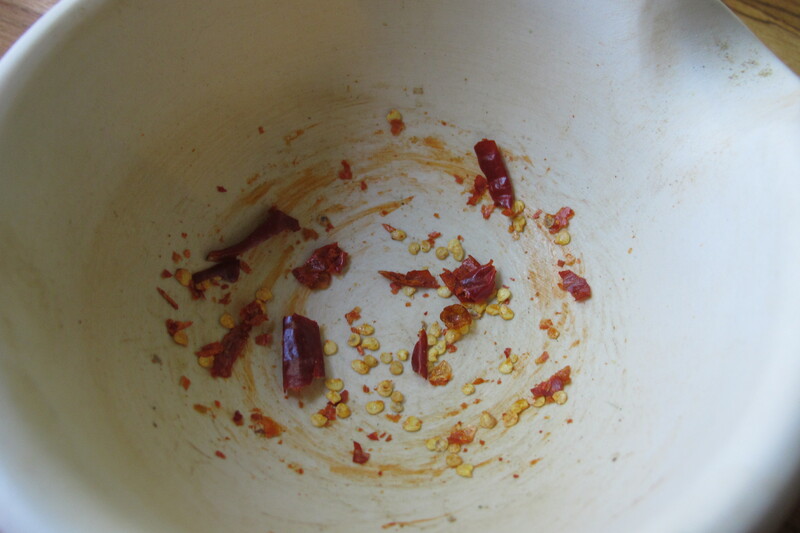 In a mortar and pestle, grind chilies, seeds and all. 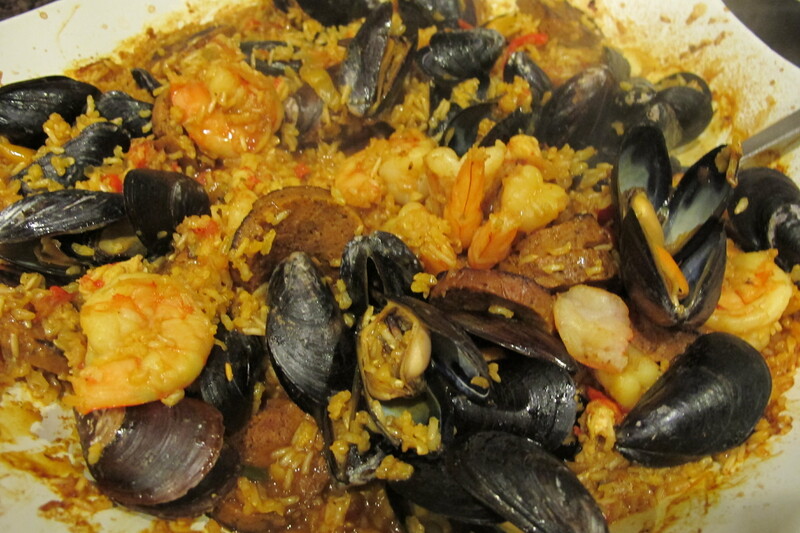 In a small/medium pot combine all ingredients and heat to a simmer for 10 min. Strain liquid, removing chilies and cherries. Reserve liquid and cherries. Place liquid in a shallow container and freeze for 3 hrs. 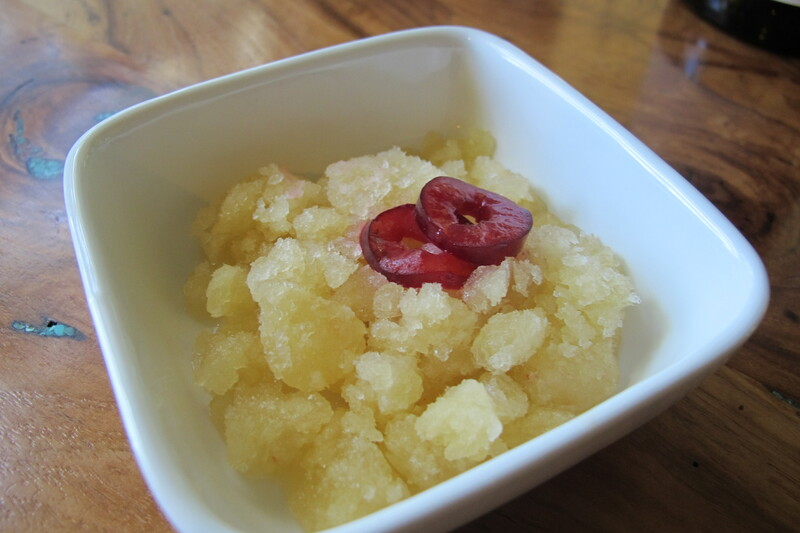 Once liquid is frozen, churn up with two forks and serve, garnishing with the soaked sliced cherries. 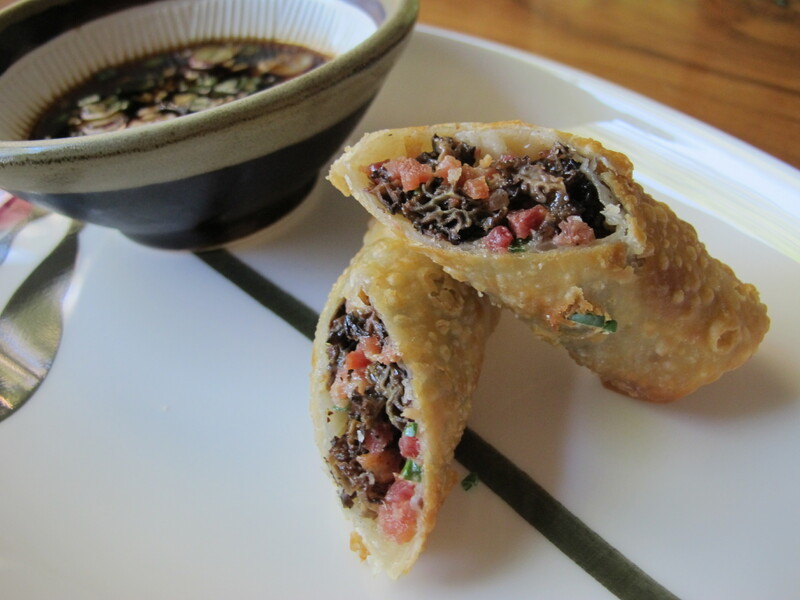 Morel, Bacon, and Parmigiano-Reggiano Stuffed Egg Rolls with an Agave Yuzu Soy Sauce Infused with Garlic, Ginger, and Purple Scallions. Please help me spread the word! Thanks and CHEERS! 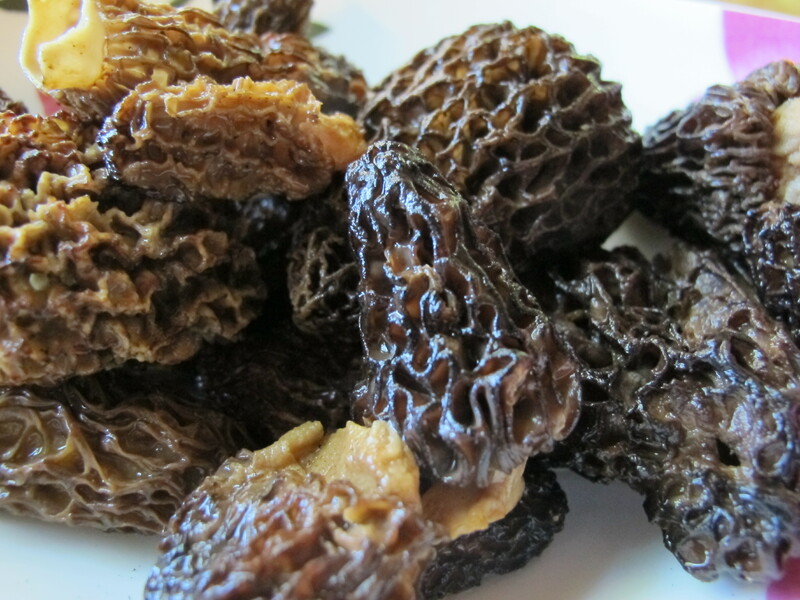 Marx Foods 4th Annual Morel Challenge! So I’d first like to say sorry for not having a pizza post this week, I’ve been sick for the past week almost. 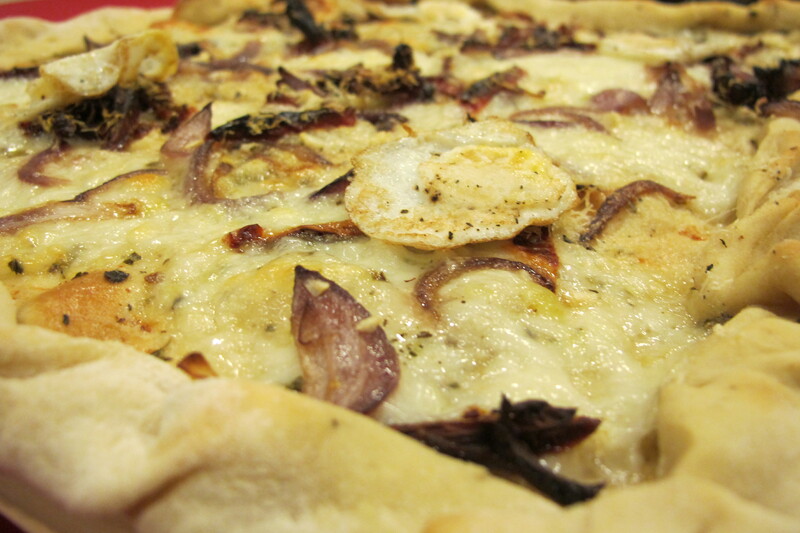 Dry your tears everyone because I will be making it up to you with the most amazing pizza in ZBD history this week. 🙂 But for now enjoy this delicious recipe. 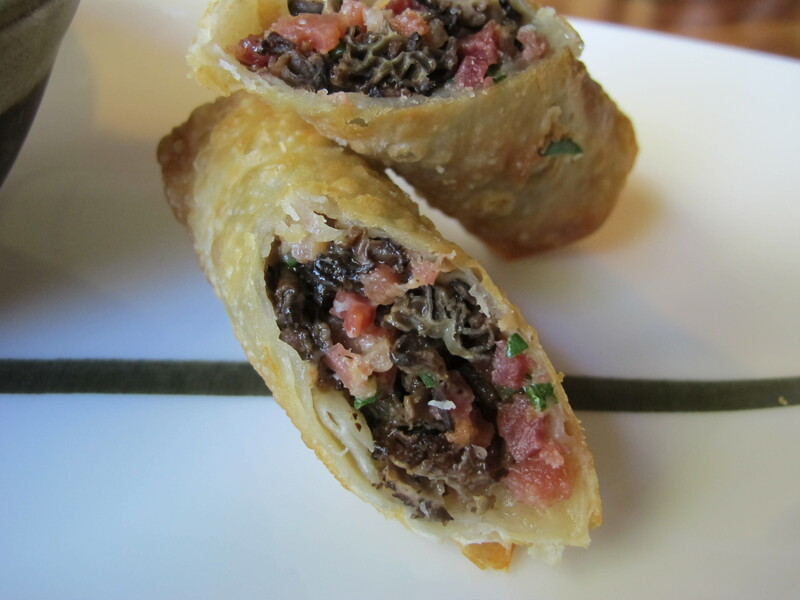 These are not your average egg rolls! They were incredible and I’ll be making these again for sure! 1 egg, beaten (to seal egg roll). 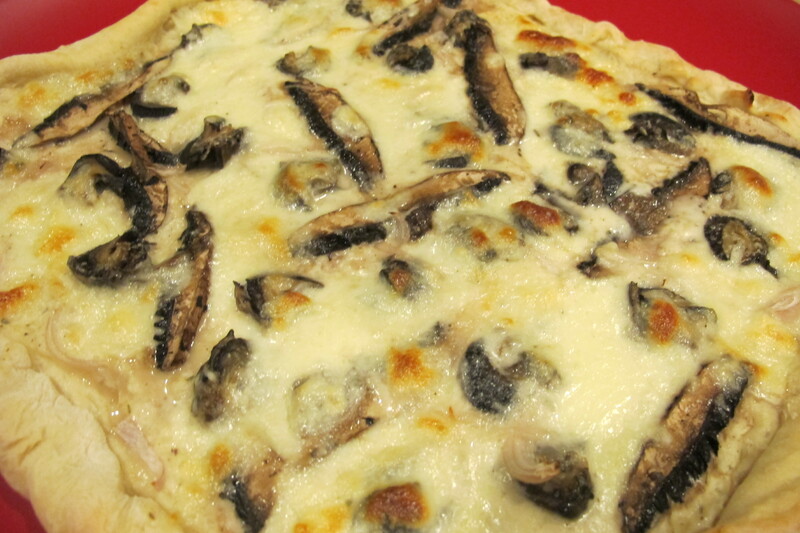 Make sauce while you reconstitute Morels, By combining all “sauce” ingredients then place in fridge. 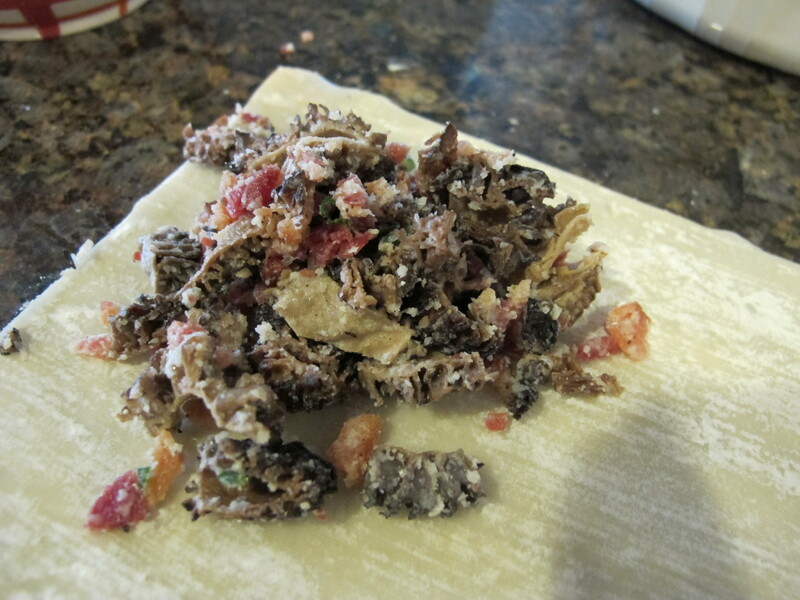 Lay out egg roll wrapper and place a ball of the mixture on the top corner and roll down until it’s a triangle, then fold in the corners and finish rolling, sealing with egg wash on the seams. Repeat until done. Heat fryer oil to 350 F. once hot place egg rolls in and cook for about 5 min or until golden. Turning occasionally throughout the duration of cooking. Transfer onto paper towel before serving. 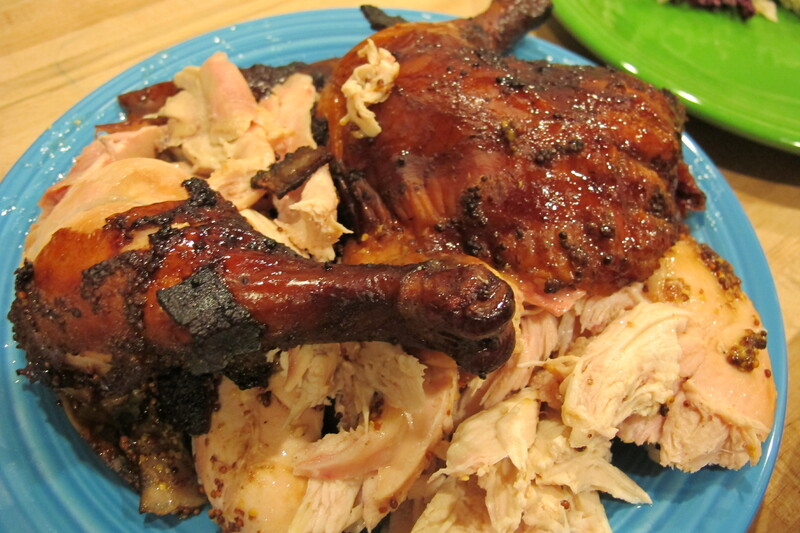 Serve with sauce and enjoy! Cheers! Stay tuned for the next post, you won’t want to miss the OXO Gadget Giveaway! Marx Foods has provided me with 1 oz of Dried Morels to experiment with. 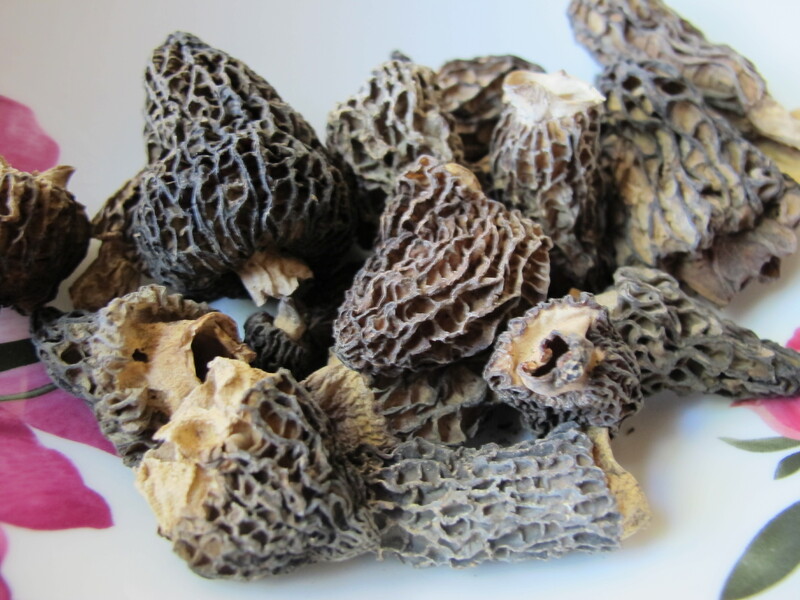 I received the Morels at no charge to me and I am under no obligation to return the product but can keep it for me own personal use. Also I’d like to thank you all for voting for me in the Marx Foods Fregola Dessert Challenge, I won! Now for the hard part… picking out $100 worth of Marx foods, Aye!!! All the amazing choices!!! 🙂 To say thank you I’d like to share with you a way to get your own free samples, Marx Foods is freakin’ AWESOME! If you are interested, email Katie: kwallace at marxfoods dot com. 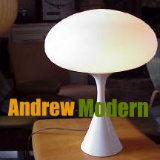 Include in your email your address, full name and blog URL. Supplies are limited, so first come first served. 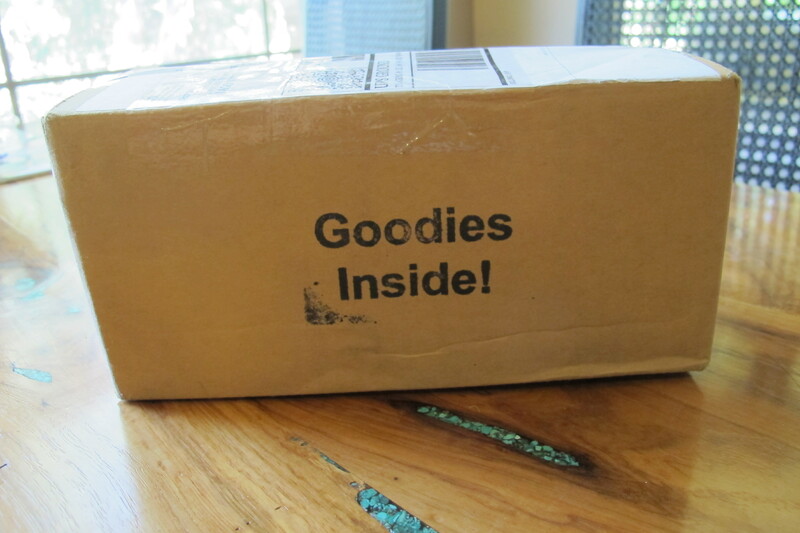 And, you don’t really have to be a blogger … if you promise to put the ingredients to good use and take your culinary game to the next level, then they will send some to you anyway. 1/2 lb Fresh bison, ground. 3/4 C. Cheese blend, I used provolone, swiss, asiago, and white cheddar. 2 TBS. 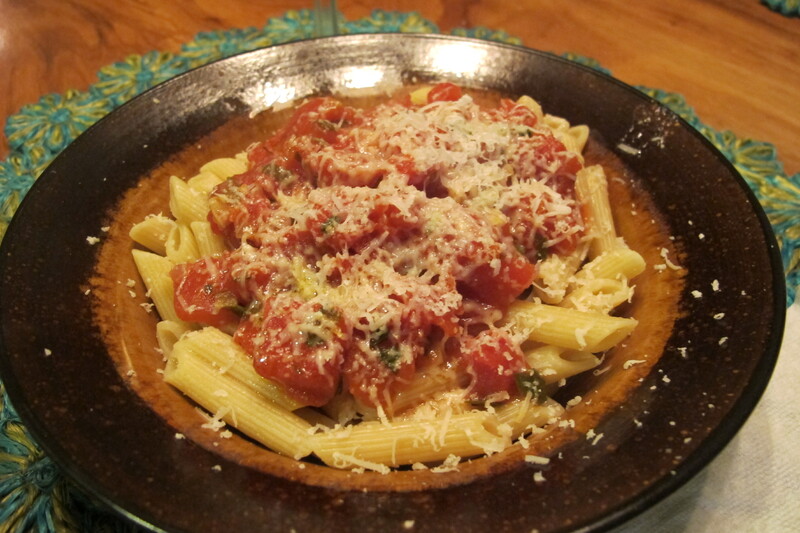 Parmesan Reggiano , (the good kind please). 1 Small Zucchini, sliced in thin circles. In a medium skillet, brown bison, shallots, and garlic until cooked. Add in sour cream, most of the cheese blend (save a couple pinches to top the meat on you place in mushroom), and spices, mix well. Wash off mushrooms if need be. 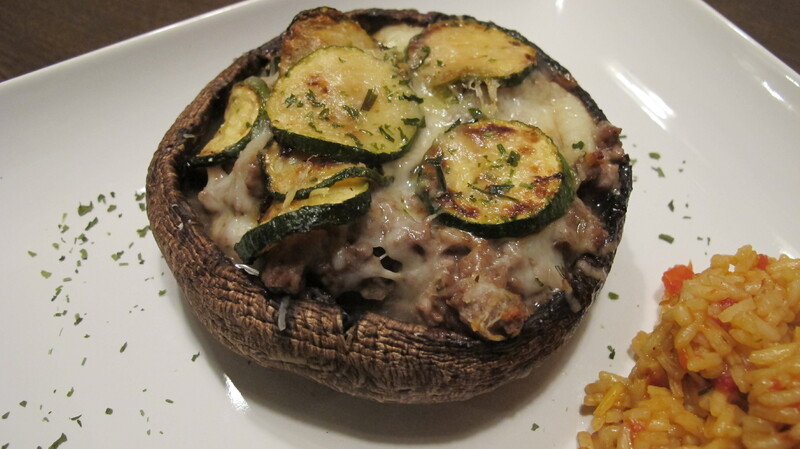 Transfer meat mixture into mushrooms. Put remaining blend cheese on top. Heat same skillet back up to high (should still be hot) and add butter, and brown zucchini rounds and flip and repeat. 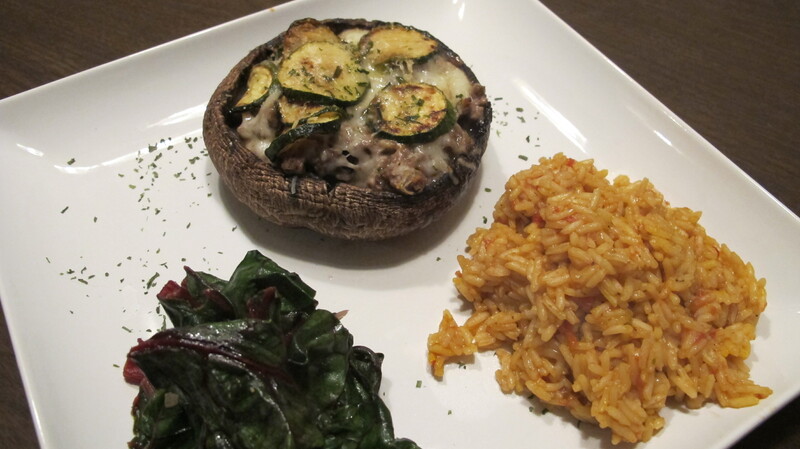 Top mushrooms with zucchini’s (about 5-6 per mushroom). 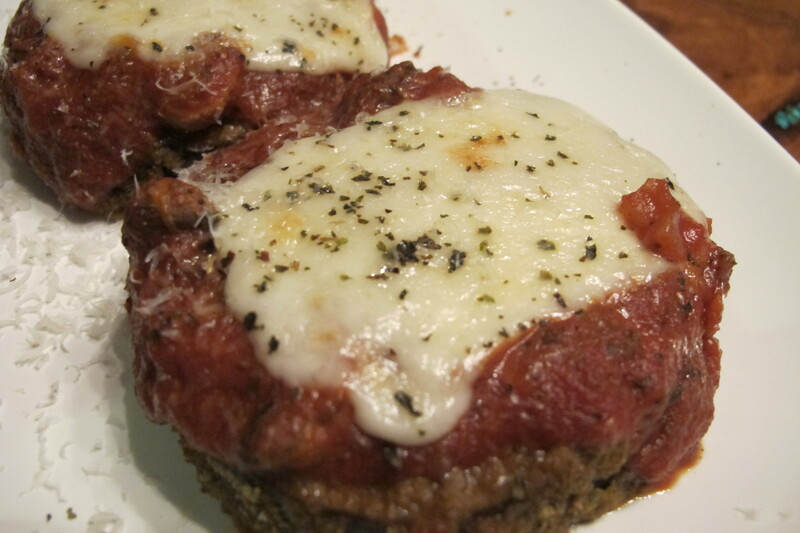 Then sprinkle a TBS of parm on top of each. Bake for about 20 min. 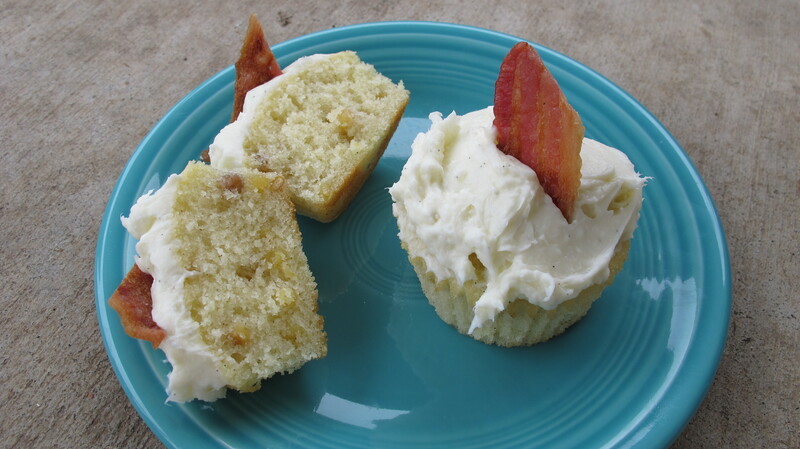 Marx Food’s Dessert Challenge Voting is Live: Please Vote for ZestyBeanDog! The polls will close at noon PST on 12/8, so make sure you vote before the deadline! The winner of this poll is going to receive $100 worth of baking ingredients (of their choice) from MarxFoods.com. They recently added some great items to the store…think of how much baking you could get done with a quart of premium vanilla extract…you’d sure be busy! 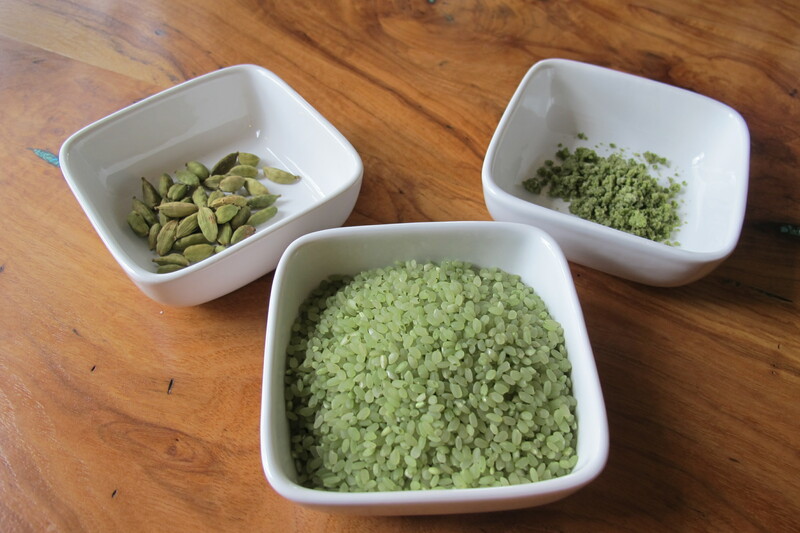 There’s also bulk dried fruit, specialty sugars, yuzu juice, elderflower syrup….the list is long and delicious! Thanks for all your help 🙂 Cheers! 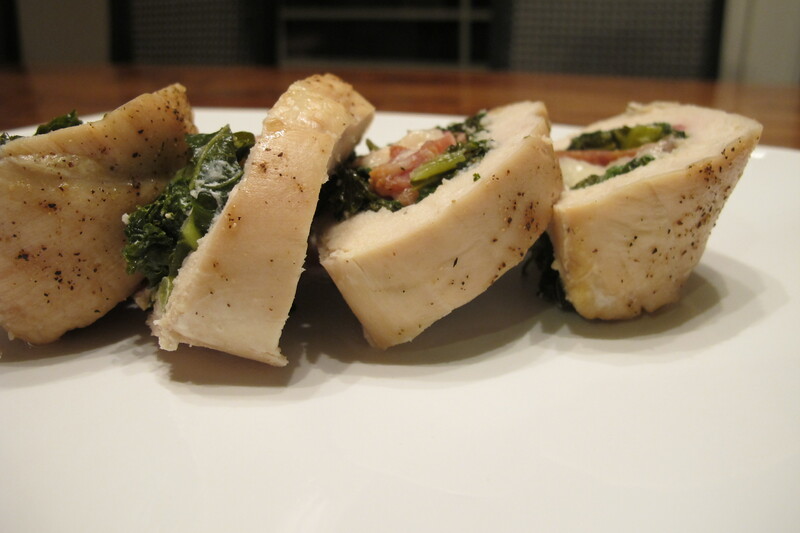 I’m entering the Iron Foodie Contest (from the Foodie Blogroll) and these are my submission Q/A’s! I’ll let everyone know If I’m selected on November 10th! Keep your fingers crossed! I want to compete because I LOVE a good competition! I’ve never competed in a food challenge before but often find my self day- dreaming of being on Chopped, The Next Food Network Star, Top Chef or Iron Chef. I was so excited to see this challenge in my inbox and have been pondering these questions ever since. I’m ready for this challenge and would love to show the blogosphere what I’ve got! You won’t be disappointed! I would like to spend the day with Thomas Keller, his tastings are amazing! I’ve always been envious of him, the fact that he can create these journeys of emotion through these delicate tastings. He never uses the same ingredient over in one of his 9 course tasting menus… every bite is truly unique! I would love to let all my senses loose in the French Laundry Kitchen for a day! I cannot stand the pre-marinated fajitas or tenderloins (or really any pre-marinated meats for that matter)- the one’s that are pre-packaged at the grocery store! They have tons of weird chemical solutions in them and they make the meats taste VERY strange and in result they have a very unnatural texture…. 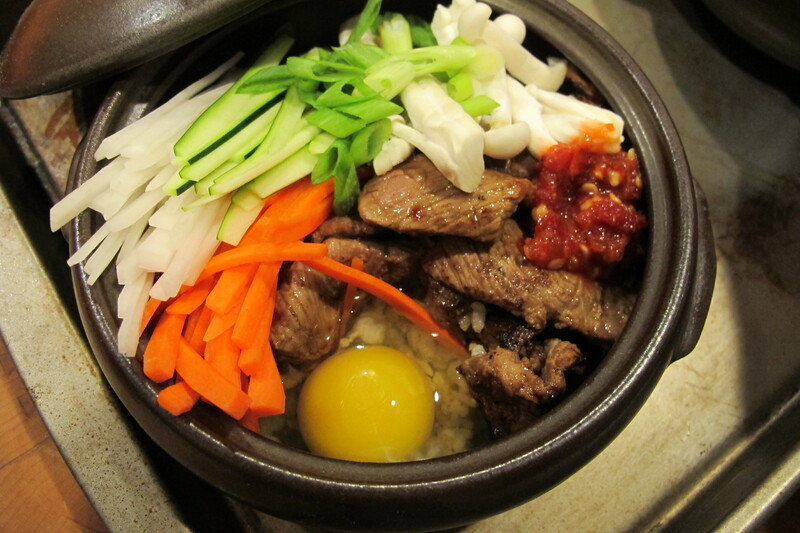 Marinate and tenderize it yourself!